Has your bathtub developed those yucky stain spots that just won’t come off? If this hasn’t happened to you at some point, the cleaning fairies must be on your side. Stains in the bathtub are common. Luckily for us, we have bleach. 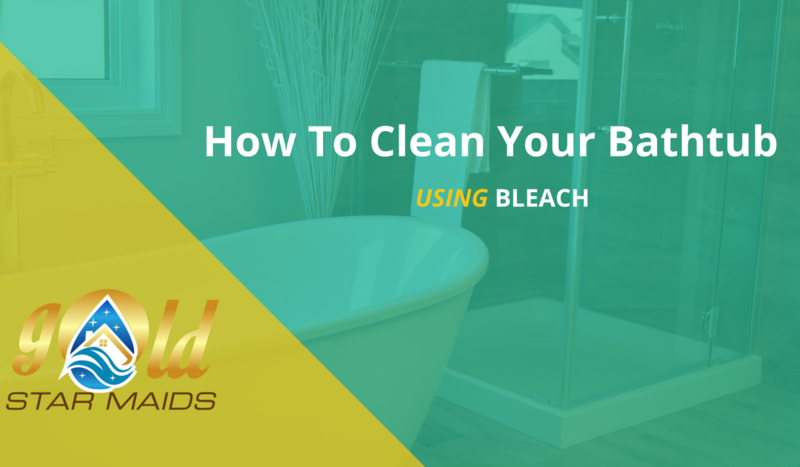 Bleach can work miracles when it comes to stain removal for tub surfaces. So, if you are wondering how to clean your bathtub with bleach, you are going to love this post. For those of you who are not familiar with using bleach, here are some facts about the product and what it does. This may seem like a big project to get that tub cleaned up and stain free using a chemical as strong as bleach. It really isn’t though. It only takes a few simple steps, and we have them here for you. Follow these steps and your tub should be left looking better then ever before. 1) Check your bleach supply: you will need at least half a gallon (follow directions on bleach bottle for more precise measurements if you are concerned about working with bleach). If you don’t have that much be sure to get your hands on some before you embark on the following steps. It doesn’t really matter what kind of bleach you use – it will all work the same for a job like this. 2) Rinse your tub out: beginning with a nice clean area is always a good way to start any project. 3) Turn your water on: leave it running until it gets as hot as it possibly can. If your hot water doesn’t get very hot, consider boiling some water to add to the tub to heat it up a little extra. 4) Plug your tub up: let the (hopefully) steaming hot water fill the tub. Fill the tub as high as you want, without it overflowing of course. 5) Pour the bleach in: check the directions for use on your bleach jug to find the proper proportions. It will most likely be a good few cups that you add to the water, especially if you fill your tub up nice and high. For general use, here are proportions for a water and bleach solution. 6) Let it sit: this is the easiest step of all. After adding the bleach all you have to do is let the water and bleach solution soak in your tub for about 10-15 minutes. 7) Time for draining: let it all drain out. This should be the most satisfying step to the process. At this point your tub should be looking stain free, shiny, and white. If there are still some stubborn spots on there that didn’t come off you could make a bleach and water solution in a spray bottle, spray those spots and give them a little extra scrub. 8) Rinse it all out: since bleach is such a strong chemical you will want to rinse your whole tub down as the finishing touch. You don’t need anything special to do this. Just hot water will do the trick. Bleach is a powerful and chemically-charged solution so it’s important to use it safely and moderately. Be sure that there is proper ventilation in your bathroom when you are using bleach. For more information on using bleach safely. Also, be sure to be careful of your clothes when using the chemical as it can easily bleach fabrics out when it makes contact. Consider wearing old clothes you don’t care about. What about slips and falls in a tube. Bleach is dangerous in that arena is it. Are saying most of the bleach should be gone after the rinse?